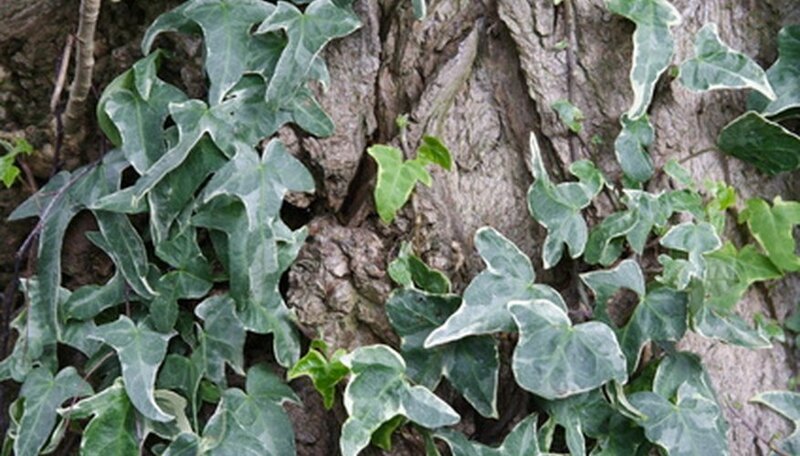 English ivy is an invasive evergreen weed. Its rapid growth habit makes it a threat to other garden plants. It will climb up trees and cover shrubs and other plants. Ultimately, English ivy will suffocate plants by blocking their access to light that is essential for growth. Eradicating English ivy in a natural way requires dedication and persistence over a long period of time. If you cut the trunk of the ivy vine, the portions of the plant above the cut will eventually die. This will, for a short time, weaken the plant and you may be able to pull out the rest of the ivy. You may need a screwdriver or other garden tool to pry the vines off of trees and other plants. English ivy has small, root-like tentacles that cling to whatever the vine is growing on. English ivy growing as a groundcover can sometimes be pulled by hand. You will have to repeatedly pull out new growth to keep the ivy under control. Most likely, this method will not eradicate the weed, but it may help you to manage its aggressive growth. A method that may be more effective than cutting or pulling your English ivy is using a heavy mulch to smother it. For the best results, first place a layer of cardboard over the vines. Cover the cardboard with mulch, such as grass clippings, hay or wood chips. The layer of mulch should be several inches thick. You will need to add new mulch as the first layer decomposes. Applying mulch for at least two growing seasons may sufficiently smother the vines, resulting in death. After eradicating your English ivy as much as possible, consider planting a native species in its place that can compete with any vines that may regrow. Since English ivy is a drought-tolerant evergreen, planting native drought-tolerant evergreens is essential. You want to install a plant that can compete well with any remaining English ivy vines. Some examples of native plants that may be able to compete against English ivy are woodland aster, creeping mint, creeping phlox and Solomon's seal. Always wear gloves when removing English ivy. Some people will develop skin irritation to the toxins in the plant's leaves and roots. In addition, it can sometimes be difficult to tell what is underneath thick English ivy vines, and you don't want to stick your hand unknowingly into other plants that may cause irritation or scratch the skin. As best as you can, minimize any damage you cause to the trees or plants the ivy is growing on. Finally, remember that cutting any plant back can stimulate vigorous regrowth. You will not successfully eradicate your English ivy in your first attempt. Diligence and repeated cutting, pulling and mulching are the only ways to manage regrowth without resorting to herbicides.